Rob Wilson, aka ‘Chief Toaster’ and CEO of the amazing Toast Ale, tells us a little about the two years old company and the time of its birth. Winnow celebrated 5 years with the Sustainable Workspaces community. We enjoyed the party just as much as we enjoy having them in our space. It was time for some kudos. December has been an eventful month for AirEx - not only were they announced 'Cleantech Startup of the Year' but they also successfully closed their pre-seed investment. Powervault have launched their fourth crowdcube crowdfunding round, with the aim of accelerating their market growth as the business reaches an exciting tipping point for mass market deployment. Welcome to the Founder's Podcast. We'll be bringing you short talks with the founders of the sustainable startups we host in our space to get a glimpse into their stories: what made them get up one day and decide they want to start something new and how they turned an idea into a successful company. Today we're happy to have Chris Forbes from Cheeky Panda with us. Chris followed his wife Julie and together they created the company leading the industry of bamboo toilet paper and other products selling in top retailers and chain stores from Planet Organic to Tesco and Amazon and winning endless prizes and competitions and the way. Lately they've secured another million funding from Northern & Shell. And we're here to hear all about it. Chris: I'm Happy to answer all questions and share some of the journey. So what would you like to know first? Well, we'll start with the personal. You started Cheeky Panda with your wife? Chris: Yes, so Cheeky Panda was Julie's idea. She talked to me for about year before we actually created the company and it's one of those things - she worked with sustainability, LED lighting before right in the early stages when it came into the UK. She knew the space and said: I think that bamboo tissue is going to be in the future of tissue. I was running an executive search business at that time, so I said Well it sounds interesting. Let's see. And she kept talking about it, kept talking about it. Finally it was on a trip to China, at the end of 2015. I went to meet her parents and as part of that trip we went to investigate bamboo. What surprised me was the scale of the bamboo. There was obviously no point in a business unless it can scale and then the second thing was how modern the manufacturing was which I didn't really expect. It was a way better than anything we've got in the west because they were all new factories, super optimized even using the pulping steam to power the pulping plant. So that really surprised me and even from an ethical point of view they are doing everything to the correct standards and it makes creating this business a bit of a no brainer. Julie and Chris, When it all started. So you left the suit behind? Chris: No, I still wear the suit, and actually i have just sold that business. I've always been a corporate guy, but I've always been passionate about sustainability as well. We took baby steps into creating the company. We crowdfunded it initially, to make sure there was a market for it. We started off with just £10,000, but we overfunded. So we did well and saw there's demand for it. After the first couple of months progressed we could see there was a real appetite for it! Then it became less of a part time project but rather a full time project for the both of us. But you stepped into a new ground, you background is not loo paper. Chris: I've spent a lot of time working with management consultancies, the likes of PWC and Ernst & Young. So I knew all about the supply chain, fulfilment and operations as well corporate finance. I say to people that I have done a 20 year MBA because I knew all the theory about how to grow great businesses and the things you need to do but I've never actually done it in practice. It's so much nicer to actually have a product rather than just talking about services and it is much more rewarding to be running a product based business rather than just consulting. Still you're stepping into a new grounds and it's not empty. There are some big names in the loo paper business. Chris: The size of the market in the UK is 1.8 Billion, the global market is 50 billion. There's a lot of very big players that have got long term relationships. It shouldn't be underestimated what we've tried to achieve in this space. The way I see it, it hasn't been disrupted in 20 years and it was ripe for disruption. It takes people from outside the sector to disrupt the sector. We just approached it with fresh eyes. The people in the industry said they would never have done half of what we've done because it's too crazy. But to us it just seemed like a second nature thing. "It's obvious. Let's do it!" We caught the big guys off foot a little bit because we do things very fast, we're creating new products that would have taken them years to develop..
"The way I see it, it hasn't been disrupted in 20 years and it was ripe for disruption. It takes people from outside the sector to disrupt the sector. We just approached it with fresh eyes." So you're venturing into new ground and leaving the safe ground behind. Did you get support from people? Chris: Well I did bet everything on this. I used the money from my executive search business to fund the creation of a new business, like a typical entrepreneur. I always believed it would work but you never really know. So the first 18 months we didn't pay ourselves a salary and worked out of the house. There was a lot of high pressure, there was a lot of risk and all the money that we we made we ploughed it back into the business. I think that people could see that we were serious about it and it wasn't just like our hobby or a play thing. The more people saw we're serious, and the better that we did, then more people start to support us. I think that what we've done in the last two and a half years to get to where we are, 20 million valuation, is is a lot of hard work and a lot of belief and and a lot of support from a lot of people as well. We haven't just done by ourselves and you know we wouldn't be the size it wasn't for the team that we've got currently and also we've got some great investors and people that have gone out of their way to help us. It's amazing when you're doing something entrepreneurial the amount of support you actually get from the wider market. It's been quite rewarding from that perspective. I wouldn't have expected it to go on this fast. It was in the business plan. Weather I believe what was in the business plan or not is entirely different matter. I wouldn't tell my investors that... They're quite happy because I think they took a pinch of salt as well. To suddenly be across the international markets and be selling throughout Europe and the Middle East as well, and we have plans for the wider world, you know, it's sometimes quite surreal. It sounds surreal. Remind us how big your team is? Chris: There's eight in the team, but within the Cheeky Panda company there's about 100 people that work on the manufacturing and the supply chain. We outsource a lot of it. We've got great partners and we lean heavily on them and we wouldn't be able to have done as much as we could without that. We're a decent sized business no in total. 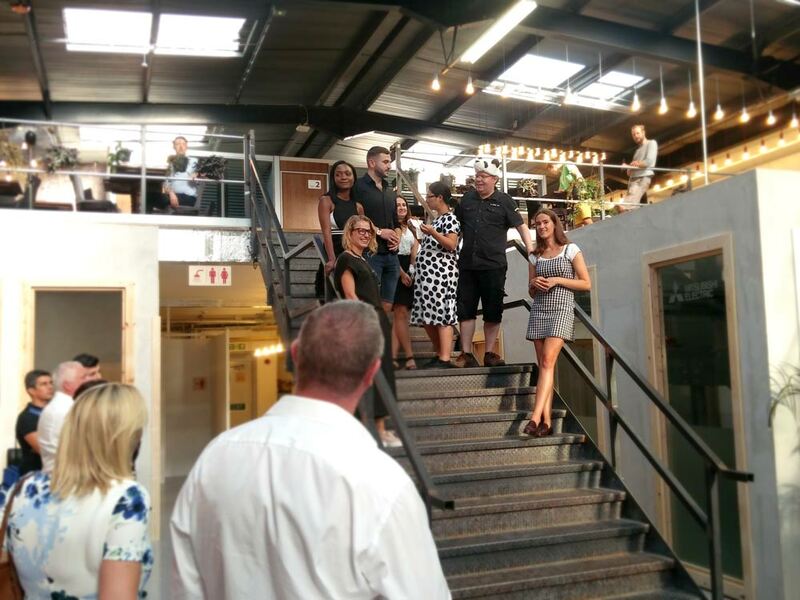 The Cheeky Panda Team in a celebration at Sustainable Workspaces. At what stage did you move out of the house and realized you need an office? Chris: When we did our seed funding round that was kind of when we realised we need to get a team in place. So we've proved ourselves in markets and at that seed stage we were already making about 20,000 pounds a month in sales. So we've kind of got to a point that we realised we can't grow any further with just the two of us, and realised we need to raise some money and build a team to scale up. So we scaled up and then we were looking for a workspace. We knew Sustainable Workspaces and James as you guys have been buying the tissues from us, and it seemed like a natural fit as well to come in here. So we came in here the start of June and we're really enjoying it. Yes, for us it was great to see the faces behind the tissue that we've been using. So it all sounds amazing and sounds like you were really taking over the world. Chris: We're having fun. I think that's a very important thing and we have got a young team, a young team of good leaders. They're ambitious people themselves, we've given them an opportunity that if they were sitting in a large corporate it would have taken them many years to get the same level of opportunity. For me it's all about the team, not just about what our vision is. The only way you can ever really be successful is having great people around you. We've chosen well and they seems to be having fun as well which is very rewarding from a personal level for me. I see your around with then and it seems like you're enjoying leading these youngsters. Chris: It's having a culture. It is very hard to retrospectively design a culture. I'm a great believer in culture and if you can create the right culture in your company in the early stages then it means that when people join at a later stage the culture is already set and everyone has a sense of belonging and purpose. I think that's the difference between why companies can be good against companies being great. Good Stuff. There's a quote for us. Chris: Excellent! Maybe someone will use that at some point! Alright the last question for you: five years from now? Chris: That's a tough one. There's different routes for us. I guess we'll only really know that in about a year and a half time. The stock exchanges are courting us. They obviously see us as a full IPO potential. That's a massive commitment. Part of me thinks we would partner up with one of the large FMCG players at some point. So if we can make a difference, that's why we're doing this and if we can make a bit of money at the same time as making a difference, then everyone's going to be happy. Welcome to the Sustainable Workspaces Founders Podcast. We will be bringing you short talks with the founders of the sustainable startups we host in our space to get a glimpse into their stories. We will discuss what made them get up one day and decide they want to start something new and how they turned an idea into a successful company. This week we are talking to Ehab Sayed, founder and director of Biohm. Ehab has founded and is leading a company that aims to change the way buildings are built. The company celebrated two years since foundation, and we all got to taste Ehab’s famous homemade vegan cake.Taking on the construction world has proved challenging, to say the least, but in two years the Biohm team has managed to win almost every prize out there, receiving worldwide recognition for their groundbreaking solutions. Hi Ehab, thanks for joining us. So let's start before the beginning, what were you doing before founding BIOHM? Well I founded BIOHM while I was doing a master's course at Brunel University and at the time I had planned to finish my studies and look for a full-time job but I did a research project which led to the inception of BIOHM and that was it just stuck with it. Can you give us a short introduction of the company, what do you do? Sure, so BIOHM is a research and development company and we place biological systems at the heart of our inspiration. That means that we take all of our inspiration from natural processes and natural systems and the aim is to create a step change in the construction industry, to revolutionize the way we build and perceive our buildings. We've got three main things that we do and it's construction systems, construction materials and a range of services and research. When it comes to our materials we're working on two main materials at the moment one of them is mycelium which we're scaling up to use for insulation and the other one is ORB which is a substitute for sheet material or wood based sheet material. Mycelium consumes waste and carbon during production and it's capable of consuming anything from synthetic wastes like metal and plastic to organic waste like foods and agricultural waste. For our ORB material it mainly uses food waste and agricultural waste and an extra organic binder that we have developed. In the future we're going to be looking at developing a self-assembling material with Queen Mary University that doesn't require any human intervention. So you use vibrations to program the material, it's a living organism and it grows into the shape that you desire so it's quite Sci-fi. Our construction system which is TRIAGOMY is a completely new way of looking at buildings. It's a new way of assembling building components. It doesn't require any permanent binders or fasteners and it allows buildings to be deconstructed at any stage of their life. So you can add a room if you like, you can downsize your building. It introduces a new and agile concept within infrastructure so buildings can change with the communities and age with the communities around them. The entire building can be reused or recycled at the end of its life into new components again. So we're looking at a servitised model of house building; instead of just selling buildings at really unaffordable prices we're looking at selling the building at a much more affordable cost, a fraction of what currently buildings are priced at, and then introducing a subscription service to maintain and create any reconfigurations or even relocations of the buildings throughout their life. So yeah, we're tackling the industry from lots of different angles. How did the idea develop to start a new company? So it all started in 2015 when I started a year-long research project looking at the waste streams in the UK, and trying to identify what's causing the waste; where it's coming from and what could be done to try and improve things or even eliminate waste altogether. I found that the construction industry was creating hundreds of millions of tons of waste each year, and a lot of it was hazardous waste. That's only the recorded waste, there's lots of unrecorded waste as well, and it was just really shocking that the figures and the numbers in the amount of waste that was being generated. So I decided to focus on the construction industry and try and solve the problem. I realized that there needs to be a complete change in perception, it's not simply creating a product or trying to create a service that improves things, we need to completely transform the construction industry. I thought the route of the industry is identifying ways of building and the way we perceive buildings and I felt that if we change the way we considered a building's purpose, what we consider a building's purpose to be or what a building's function should be and that would be a great place to start. Was your background in construction? Well no, not at all. My background is in design engineering and product design. I did a bit of civil engineering in the past as well and I very quickly found myself engulfed in the construction industry. The construction industry is not a small industry, there some very big players and a lot of money involved. What made you think you can take on the construction industry? I think I was being naive and not really understanding the industry very well. I think a little bit of naivety in any company is always good because that's how you take risks. You're not so shut down by preconceptions, you've got a completely new idea of how to make things happen. The way I understood the industry was completely different to how it turns out to be, but the idea and the concept that I developed still seem to be very impactful. I think it's a bit of naivety thinking that I could take on the construction industry but I think we're doing really well. I think we're making good progress. When you got up and said I'm going to start this new company, I'm going to take on the construction Industry, and the world, it might have sounded a little crazy. Did you get a lot of support from family and friends? One of the pivotal point in starting BIOHM was getting a business mentor, who is Terence Beckett, the director of the building research establishment. He's got an incredible career and he's got a contact book that you can basically ask him to speak to anyone you can think of in the industry and he'll know them. Working with Terence normally gave me lots of insights into the industry and how it works but it made it so much easier to get to the services and the people that are necessary to to progress a company. So building a really good support network it's one of the most crucial things that I experienced on the business side of BIOHM. Ok, but that's on the business side. what about the personal side, while going off on this crazy venture? I think I've always been very passionate about trying to make a change and really develop something that's quite sustainable and transformational. I completely underestimated how difficult it would be to start company and to do it on your own, and I was on my own for the entire first year. It was incredibly challenging and really tested me but I think being very determined and passionate about the subject kept me going. You seem to have won so many awards that your email signature actually needs another email. I guess they don't just fall on you, it must have been a lot of work going the competition way. Absolutely, yeah. I think that we only didn't get shortlisted or win three competitions out of all the ones we applied for. So we're not constantly applying for competitions, but it's something that definitely gives us credibility and helps us realize that we're on the right track. I think it's also about having something that's been holistically thought through. We developed a new construction system but that's not all we're doing we're also developing a new intelligent platform that helps manage the entire industry and we're developing construction materials to support construction systems as well as other established construction systems. It's understanding that you need a very holistic approach and you need to tackle a very complex industry with complex problems in lots of different angles. I think it's it's because we have more than just a product, we have a very strong philosophy and a very strong vision and that's why I think people tend to really believe in what we do and support us. About a week ago or two weeks ago now, you celebrated your second birthday. You showed this beautiful presentation and one of the great aspects of the presentation is that you gave credit to the team behind you. It's 15 people now, spread around the world, how did this team come about? Really glad you asked me this question, because I wouldn't have been able to get anywhere near where I am now without the team. I have the most incredible team. They're all incredibly passionate and dedicated and they're really good people they're really well-intentioned. I think it's one of the most important things when building a team is making sure that everyone's ethos is aligned and that's something that happened naturally with us. I've never filed a job vacancy or tried to seek or employ someone or bring someone on board, it all happened very organically through presenting at events or doing talks or workshops and doing lectures at universities. Every time that we presented our concept or our philosophy someone's been interested in in joining and it's really difficult to say no but it we didn't say no it would be a little ridiculous. I think that when you've got something that's got a very strong vision and a very strong trajectory you often get the right people interested and the right people on board. One of the most incredible things about the team is that everyone's from completely different discipline so you've got people from biology background, people from an architecture background, design, business, law, foods, anthropology; quite a varied team, but when we're tackling a problem or when we're trying to solve a specific issue or develop a product, we' re able to look at it from so many different angles, from different disciplines. Someone who's been studying a science their whole life looks at life in a complete different way to someone who's been studying design their whole life and that's a really good way to ensure that you consider every factor in what you're developing. Some of Biohm's ever-growing team of 15 talented and passionate innovators. At what stage did you move into sustainable workspaces? We moved in March this year and it's been absolutely incredible. We can't really be happier with where we're based at the moment. It was surely after we grew from a team of two to a team of, I think it was 11 or 10 at the time, and at that time I realized we need more space, and that we need to be based somewhere a bit more central and that's when we moved. We've got four desks but people work at different times and so some people come in twice a week, some do one once a week and some are doing it full-time, so it varies. Where do you see BIOHM 5 years from now? Five years from now we would have launched our construction system TRIAGOMY. Right now we're mainly focused on our material development and once the construction system is launched, hopefully we'll have developments that use the construction system that we can showcase and and be proud of. So five years from now, the launch of TRIGOMY and also development of a new version of TRIGOMY which is suitable for skyscrapers and that's going to be quite an exciting time. Well that's great! We wish you luck in changing the world! We're delighted to announce that Grocery Accelerator have joined our community. We sat down with them and asked them a few questions. We're delighted to have SolaGrow join the community recently, so we sat down with their CEO Rachael Graham and here's what she had to say. Safety Net's Dan Watson is one of 35 picked out as MIT Technology Review's Innovators Under 35 in Europe. We're delighted to announce the arrival of DryGro to the community. We sat down with CEO Sean Peters who explains everything DyrGro! Having raised close to £800k, Sustainable Accelerator are now seeking up to 8 circular economy focused start-ups to invest the money in. 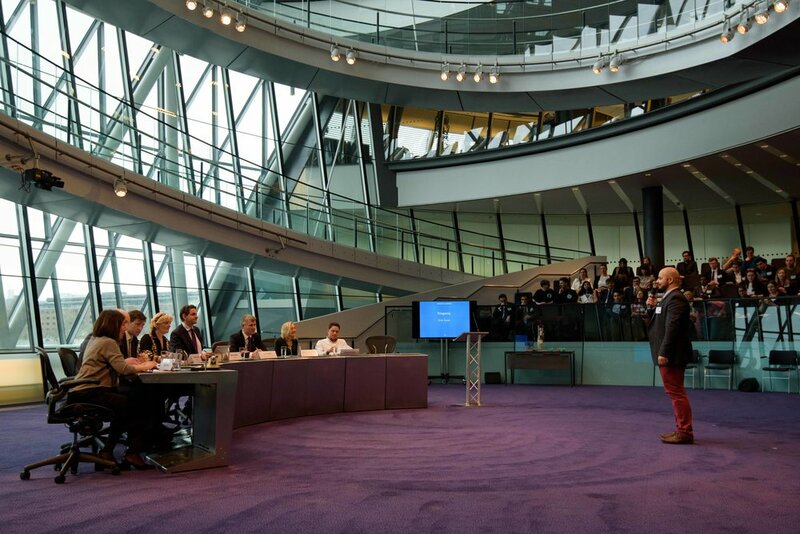 We were honoured that the Mayor of London Sadiq Khan announced our project called Better Futures, one of our clean tech incubation programmes aiming to cultivate 100 small businesses giving them the extra boost in development they may need to be successful. Global EVRT kicked-off the European edition of their road trip this week with a E-Mobility Conference which will be a mixture of networking and panel discussions with Sustainable Bridges and E-Car Club’s Chris Morris (MD) amongst the speakers on the day. Powervault have teamed up with electricity supplier Tonik Energy to trial a smart electricity tariff constructed to reduce bills by bringing battery storage units into more UK home. Tonik Energy will trial the Powervault energy storage units with their customers who have smart meters in their home. The two companies have said the aim was to prove the concept of the UK first storage tariff. Next month, Dan Watson and the Safety Net team will launch their Indiegogo crowdfunding campaign. This campaign follows their successful trails with their new PISCES device, which they aim to push on with this year and bring to the masses. We hosted the first Cleanweb Meetup of 2017 in Sustainable Bridges. Cleanweb is the use of digital technology to address environmental sustainability, resource efficiency and climate change. There were 4 speakers and more than 30 attendees.